One of the many commendable personal qualities that Maplewood students always develop as they go through their years of studies is their concern and care for other people. We have identified this attribute as one of the Maplewood Success FactorsTM which, from our experience, are what admission officers at the top US colleges and universities would look for in successful applicants. Showing a concern and care for others however should not serve a purely utilitarian goal such as getting in a good college or university. We believe this personal quality brings in eye-opening opportunities and life-enriching experiences to the person. It also takes a life-long approach to build up this personal asset - from childhood in the family, to student at the school, to the working adult in the community. As an education services organization, Maplewood carries the mission to serve our students and parents with the best care and attention. Maplewood also believes in fostering a caring company culture and in performing services to the community at large. We have organized or participated in services mostly related to learning and education to the community. We call for students and parents to join in whenever such opportunities arise. Maplewood encourage students interested in volunteering and community service to explore opportunities in supporting the tremendous disaster relief and rehabilitation work in the aftermath of the May 12 Sichuan Earthquake. We suggest students to initiate efforts on their own, contacting different organizations in Hong Kong engaged in relief and rehabilitation work, and lending a hand in work such as finance and accounting of donation proceeds, relief project planning and execution (e.g. organizing fundraising events), management of supplies inventories and logistics, chronicle of relief work and publicity. For those who can travel to Sichuan, they may look into offering assistance and support in medical and health care, engineering and building safety assessment, student and peer counseling, teaching, children and elderly day care, distribution of food and relief supplies, writing travelogs and stories of relief work and progress to share with others. Students can also tie in their summer community service with their potential academic interests - by gaining exposure to fields from health science, medicine, engineering, logistics, finance and accounting, to non-government organization management, social work, education, psychology, journalism, and more. We believe the benefit to the student will largely come from making liaison with different organizations and setting up the student's own community service program related to the disaster relief. This will be far more challenging but also rewarding than just joining a standard voluteering service program. Maplewood Education Services is happy to offer advice and counsel to students on their liaison and planning in setting up their summer volunteer services related to the Sichuan earthquake relief work. Contact us at quake_relief@maplewood-edu.com. Maplewood Education Services is sponsoring the following concert events to help raise funds for organizations that have been building schools or engaged in education projects in remote areas of China. The tasks at hand now are to leverage prior experiences to quickly rebuild safe schools and support surviving school children in the disaster areas. Many Maplewood students have been looking for good community service projects to participate in during the summer holidays. Our students believe that through meaningful community services, they can gain a deeper understanding of their community, show their concern for others, and develop better awareness and maturity in themselves. Maplewood Education Services, in partnership with Hon Wah Middle School, launched the Chinglin English Peer Tutoring Program for students in summer 2005. Volunteer students were recruited from international schools and local English-medium schools in Hong Kong, as well as secondary schools in the UK to provide conversational English and reading/writing workshops to fellow students at Hon Wah, a local secondary school in Hong Kong which uses Chinese as the medium of instruction. Student tutors had the opportunity to meet their peers who might have come from different socioeconomic backgrounds and help improve their skills and confidence in the use of English. For example, many students came from recent immigrant backgrounds and had only started to learn English formally at teenage. Students became proactive in community service by taking ownership of the tutoring program with minimal guidance from Maplewood. There were plenty of opportunities for them to plan and work cooperatively with each other, to share their energy and talents, to initiate learning activities and outings, and to motivate and learn from their own peers. In summer 2006 and 2007, Maplewood Education Services coordinated the Chinglin English Peer Tutoring Program with Fukien Middle School (North Point) in the summer (mid-July to early August). Maplewood plans to organize the program annually with local schools in Hong Kong. Chinglin Peer Tutoring Program 2007. Chinglin Peer Tutoring Program 2006. Chinglin Peer Tutoring Program 2005. SCMP Young Post cover story August 29, 2005 (pdf file, 298 KB). Maplewood Education Services was a corporate sponsor to the Rotary RainLily Project, with the goals of raising awareness on sexual violence issues among school children in primary and secondary schools, as well as among members of the local communities. 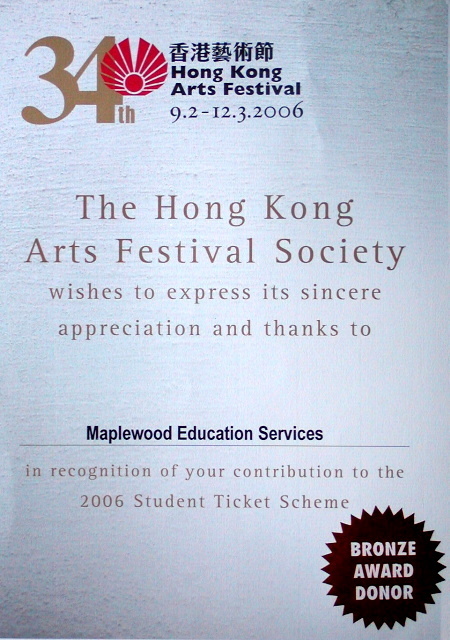 Maplewood's sponsorship in the project helped support educational programs on sexual violence issues in primary and secondary schools in the New Territories districts in Hong Kong where sexual violence incidents are more prevalent, and community outreach programs engaging parents and school children in role-plays, games, discussions, and dialogs on sexual harassment, sexual violence, gender equality topics. By targeting students in particular, the project hopes to foster these very important aspects of life in the youth of Hong Kong early on in their lives. The Rotary RainLily Project was co-organized by Rotary Club of City Northwest Hong Kong and Rotary Club of Kingspark Hong Kong in partnership with the Association Concerning Sexual Violence Against Women. Various programs took place from October 2006 through May 2007. Perry Yu, Maplewood's Education Consultant and Director, was in the panel of judges for the semi-final round of the Third Biliteracy Trilingualism Composition and Speech Competition co-organized by the Rotary Club of Hong Kong Island West and the Hong Kong Federation of Education Workers. In this competition, high school students in Hong Kong demonstrated a high level of competency in the use of both Chinese and English languages through writing, interactive discussion, and public speaking. In Chinese public speaking, both the Cantonese and the Putonghua dialects were tested. The students also had to show they were well informed on current affairs and were able to think on the spot. Not a small feat to accomplish for the winning contestants at all. A strong grasp of biculturalism through language competency can prepare a student well for further studies and their future careers. Perry had also been invited to adjudicate at the semi-final round of the Second Biliteracy and Trilingualism Composition and Speech Competition also coorganized by the Rotary Club of Hong Kong Island West and the Hong Kong Federration of Education Workers in November 2005. Maplewood has been actively involved in education and learning programs in the local community since our founding. David Lai, Maplewood's Education Consultant and Director, was a referee in the K*bot Hong Kong 2005 competition held on July 6, 2005, at the Hong Kong Polytechnic University. More on K*bot Hong Kong 2005. Arts appreciation nurtures creativity and cultural understanding. Exposure to the arts also cultivates a more well-rounded person. Students in Hong Kong probably have one of the best opportunities to appreciate and enjoy the widest spectrum of local and international performing arts in the world, given the volume of world-class artists passing through each year and many diversified talents available locally. While many students have learned to dance, sing, act, or play a musical instrument, not all have had the chance to attend world-class performances, not to mention develop a habit of attending professional performances regularly. Extracurricular arts activities have often been geared towards interschool competitions or certification exams. 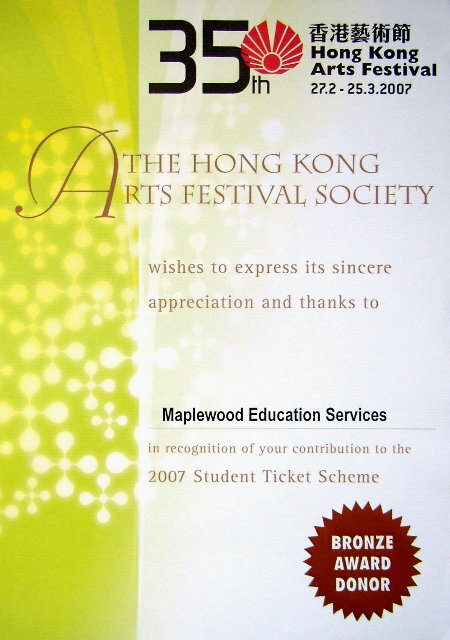 With our sponsorship on student tickets at the Hong Kong Arts Festival, Maplewood hopes that more programs are made accessible and affordable to students, and that more of them will have an opportunity to develop an appreciation and understanding of the arts at a younger age. 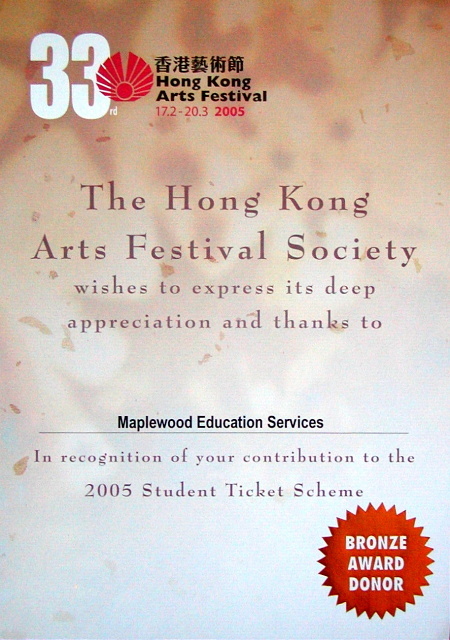 Maplewood has been a Bronze Award Donor to the Hong Kong Arts Festival Student Ticket Scheme in consecutive years since the 33rd Hong Kong Arts Festival in 2005. The festival runs for about a month in February and March in Hong Kong. Maplewood Education Services had a busy month meeting students, teachers, and parents at local Hong Kong schools. Maplewood was invited to present on Further Studies in the USA at St Stephen's Girls' College on June 25, 2009, and at the Further Education Seminar organized by the St Paul's Co-educational College Parent-Teacher Association on June 20, 2009 to share with participants on the latest college admission trends, application process and time-line, cost and finance considerations, and how to prepare oneself for a winning application. Maplewood Education Services was invited to present at the Further Education Seminar organized by the St Paul's Co-educational College Parent-Teacher Association on June 21, 2008 and to share with students who aspire for higher education in the USA the hot tips and case stories of successful application to one's desirable colleges and universities. Maplewood Education Services participated in the Further Education Seminars organized by the St Paul's Co-educational College Parent-Teacher Associationon June 21 and June 25, 2007 and shared with students, teachers, and parents their experiences and insights on studying in the USA and the latest trends and watch-outs, including the critical success factors to college application success, the record-low college admission rates this year, and the deluge to register for SAT in Hong Kong. Maplewood Education Services was invited to participate in a series of Further Education Seminars at St Paul's Co-educational College Parent-Teacher Associationon June 21 and June 23, 2006. The seminars were well-attended by students, parents and teachers. Maplewood's presentations focused on studying in the USA and how to make the applications stand out. 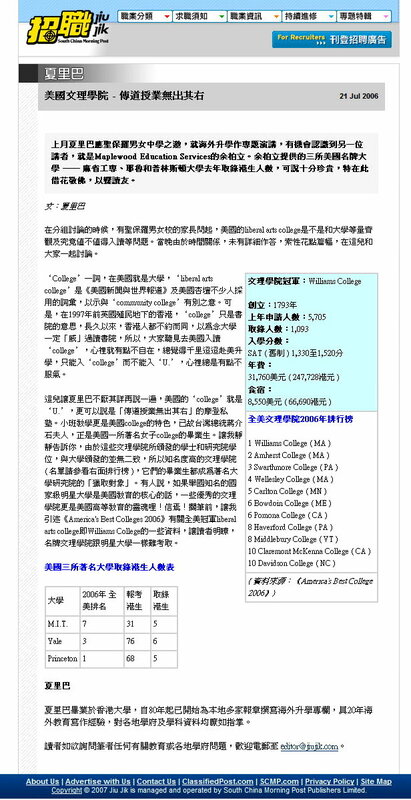 The latest trends in US college and university admissions and local admissions statistics were presented, with the latter reported in Jiu Jik, South China Morning Post, July 21, 2006. Maplewood participated in a Career Day Workshop for upper form students at St Paul's Co-educational College on November 19, 2005. Maplewood consultant Perry Yu met a group of students who aspire to study science and engineering in college and gave a presentation on Your Major in Science and Engineering and Your Career. Surveying the brave new frontiers of modern mathematics, brain and cognitive sciences, communication and photonics, nanotechnology and novel materials, biological engineering, society, technology and policy, Perry introduced to the students old and new disciplines of studies they may not be aware of, and discussed the strategy of studying what one enjoys most and developing general transferable skills including reading, writing, problem solving and teamwork in college as an adaptable approach one can take in planning one's future career in our rapidly changing and ever uncertain world. Also discussed are possible careers which follow from a science and engineering education - from the traditional careers in engineering, research and teaching to the professions in medicine, law, business, banking, finance, consulting and entrepreneurship. On October 13, 2005, Maplewood consultant Perry Yu was invited to a happy hour gathering of the La Salle College Old Boys' Association as guest speaker. Perry met with La Salle College alumni, teachers and social workers, many of whom were parents of college-bound students, and gave a brief presentation on the higher education system in the USA, its difference from the Hong Kong/British system, and the key to successfully apply to one's desirable colleges and universities. Maplewood was also invited to speak in US college and university forums at Diosesan Boys School (DBS) and Wah Yan College Kowloon in October 2005. Maplewood consultant Perry Yu spoke on University Day, October 15, 2005, at DBS to an audience of over 60 students and parents and shared information and advice on US university education. The event was jointly organized by Diosesan School Old Boys' Association (DSOBA) and DBS Careers Office. On October 22, 2005, Maplewood consultants George Wong, David Lai, Perry Yu were invited by Wah Yan One Foundation to speak at a forum Preparation for University Education in the US organized in collaboration with Wah Yan College, Hong Kong and Wah Yan College Kowloon. The forum was held at Wah Yan College Kowloon, and was well attended by over 200 students and parents who came not only from Wah Yan, but also from Marymount Secondary School and St Mary's Canossian College. Maplewood consultants spoke on Building a Winning Application, A Parent's Perspective on American Education (David is a Wah Yan parent), and Who Needs College Counseling and Why, and offered advice on costs, scholarships, financial aid, and employment. Following a panel discussion, Maplewood consultants met with the audience, students and parents informally for further discussions. We were able to answer many fundamental questions on the US education system and explain its flexibility compared to the Hong Kong and UK systems, suggest how students should choose their schools according to their interests and future goals, advise on the time line for US college application and on how to prepare for the standardized tests. We were also able to dispel some common misunderstanding such as one has to decide on a major when one applies to a US university. We were glad to have introduced in an informative way the US higher education option to many interested students attending local secondary schools. We hope this will also help open the students' options in their pursuit for the best possible higher education for themselves. Maplewood consultants participated in a US College Admissions Workshop organized jointly by the Cornell Club of Hong Kong and the Hong Kong SAR Education and Manpower Bureau (EMB). The workshop was targeted at students attending local secondary schools who had planned to study in the USA but who might not have had access to educational resources or counselors knowledgeable about the US college system. The workshop started with a seminar on the college application process followed by a Q&A/panel discussion. After lunch, the students broke out into groups to meet volunteers who had been students studying in the US. We went through their college application essays, offered suggestions to improve, and shared our experiences on studying in the US. Many students had made the basic mistakes in their essays - writing an introductory letter of themselves, recompiling their activities and school transcript information. This reflected a general lack of exposure to what US colleges and universities were looking for in applicants. By providing timely advice, the workshop filled in essential gaps of knowledge and gave the students a fair chance in achieving their academic goals to study in the USA. The one-day workshop was held on November 20, 2004, at the Aldrich Bay Government Primary School in Shau Kei Wan, Hong Kong. Copyright © 2004-2009 Maplewood Education Services Ltd. This page last updated 06/18/09 17:05.